Shopping for a new Chevrolet Bolt EV? Don't even think about not getting the $750 fast-charging option; you'll regret it on longer road trips, and it'll hurt resale value too. The 2018 Chevrolet Bolt EV remains the only affordable, available electric car that offers more than 200 miles of range. The 2018 Chevrolet Bolt EV remains a unique vehicle in the market. It's the sole electric car with more than 200 miles of range that you can buy today for less than $40,000. It's available throughout the U.S. and comes in base, LT, and top-end Premier trim levels. Like so many of the electric cars that have gone on sale since 2011, the Chevy Bolt EV is a five-door hatchback that sits on the footprint of a compact car. It's actually more spacious inside, courtesy of the smaller powertrain and a battery pack under the cabin floor, but despite a few efforts by Chevy to pitch it as a "crossover utility vehicle," it remains a front-wheel-drive hatch. That's a segment that's shrinking, granted, but the Bolt EV is the best hatch on the market today. It’s one of the best electric cars on the road, too. Its 238-mile rating eliminates range anxiety for average daily commuting and suburban use, and while it's hardly stylish, passengers will likely be impressed with its acceleration and superior infotainment system. Its owners and drivers need never go to a gas station, however, and the car can be charged every night if desired to have a "full tank" every morning. If the Bolt EV has flaws, they have to do with fast charging. It's a $750 option to fit a Bolt EV with a CCS fast-charging port—and we feel strongly that every single buyer should do just that—but today's CCS stations run at a maximum rate of 50 kilowatts, meaning unlike a Tesla, the electric Chevy may take two 30-minute fast-charging sessions to refill a totally depleted battery. Moreover, the CCS network in the U.S. currently lags behind not only the Tesla Supercharger network but even by the competing and equally slow CHAdeMO fast-charging network, used today only by the Nissan Leaf. Still, the Chevrolet Bolt EV is a remarkable vehicle. Its mix of practicality, interior volume, brisk acceleration, and fun-to-drive roadholding won it the Green Car Reports Best Car To Buy 2017 award, among many other accolades. For anyone who's considering an electric car that's not a Tesla—and quite a few of those who didn't even consider electric cars—the Chevy Bolt EV is a must-drive. The 2018 Chevy Bolt EV houses a very large interior in a boxy form; designers did their best with accents that only somewhat disguise its hatchback shape. The 2018 Chevrolet Bolt EV is essentially a tall box on wheels, though GM's stylists have used numerous accents, creases, and shapes to hide that profile to the best of their abilities. Those flourishes and accents are relatively effective at disguising its basic shape, while that same shape gives it ample interior room. 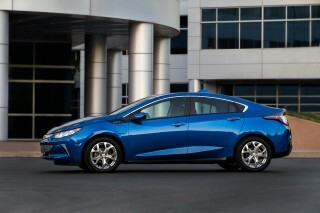 In the front, the silver or black "grille" is actually a blanking plate like that used on the Chevy Volt plug-in hybrid. From the side, body creases, a rising window line, and other touches give it a racier look than the basic profile would indicate. Those effects may make the Bolt EV seem smaller than it is, with one reason being that its wheels are pushed all the way to its corners. The EPA considers the 2018 Bolt EV to be a "small wagon," but we’d bet most shoppers would view it as a five-door hatchback. Inside the Bolt EV, the shapes of the plastic trim and in particular the thin seats telegraph a blend of economy-car efficiency and tech-forward digital interfaces. The dashboard swells toward passengers in the middle to house the touchscreen, but recedes to give more space for front-seat occupants. It works, mostly, and certainly the Bolt's controls are better-looking and far less annoying to use than those of the first-generation Chevy Volt range-extended electric car. The Bolt is more likely to attract attention for its exterior styling than its interior, and that's probably it should be. The 2018 Chevy Bolt EV's main attraction is its 238-mile range, but it also accelerates, holds the road, and corners well. 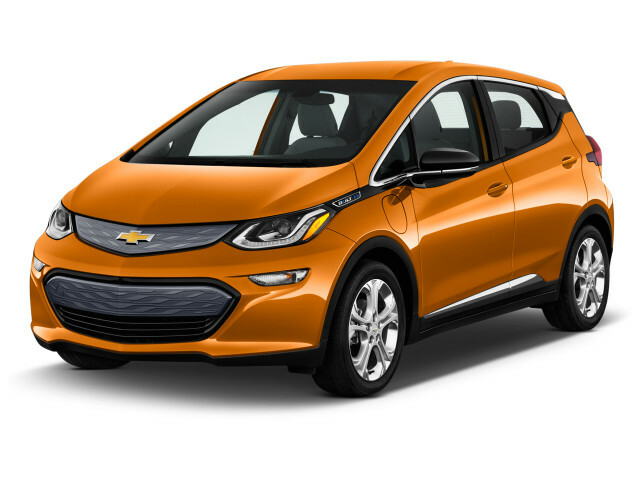 The powertrain in Chevy's electric Bolt is simplicity itself. The big, flat 60-kilowatt-hour battery pack under the floor of the cabin sends electricity to the motor that powers the front wheels. Rated at 150 kilowatts (200 horsepower) of power at its peak, the motor delivers up to 266 pound-feet of torque. That results in a quoted acceleration time from 0 to 60 mph of less than 7 seconds. A Tesla it's not, but given its shape and its electric powertrain, lots of passengers and other drivers will be surprised at how quick the Bolt EV actually is. The best part is that range anxiety simply vanishes if you have a 200-mile-plus rated range. After six hours and 240 miles behind the wheel, along California freeways and coastal roads at widely varying speeds and elevations, we managed 240 miles without trying. That distance depleted the battery, but drivers along the same route who babied their cars and kept speeds down arrived with up to 25 miles remaining. That indicates that the 238-mile range rating from the EPA isn’t just real, but can be improved on with attention to smooth, efficient driving. Drivers will earn to chose from the Bolt EV's two distinct drive modes. We preferred the Low range, which boosts regenerative braking substantially. It can slow the car to a complete stop, in fact, without the driver touching the brakes at all. That's the so-called “one-pedal driving” that the original Tesla Roadster pioneered. It’s a smoother, calmer, and easier way to drive. The more "normal" Drive mode mimics the behavior of a car with a conventional automatic transmission, including a bit of idle creep when the car is at a stop. 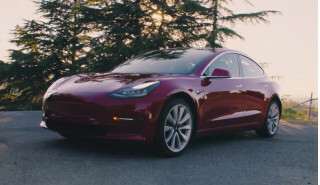 The Bolt accelerates confidently, even when carrying four adults, and drivers will learn they can make the inside front tire chirp when they apply full power coming out of a turn. The steering had a nice positive self-centering action, and the Bolt corners flat on its 17-inch alloy wheels. We heard little whine from the motor or electronics, and its brake feel was so consistent that we couldn't feel the transitions between regenerative and friction braking. 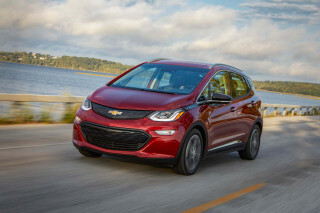 All Bolt EVs come with a portable 120-volt charging cord, although Chevy says most Bolt drivers will recharge its large battery at a 240-volt Level 2 charging station in their garage or parking spot, mostly overnight. 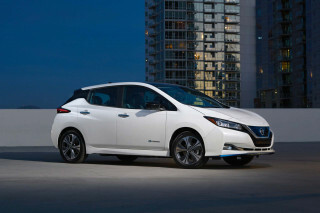 The car's onboard charger is rated at up to 7.2 kilowatts. A full recharge using a Level 2 charging station will take about 9 hours, though the company says a charge will provide "50 miles in less than 2 hours" using the same hardware. 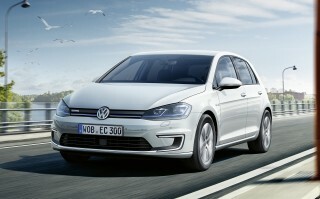 A conventional 120-volt wall socket will take most of a 24-hour day to recharge a fully depleted 60-kwh battery, however. With the interior volume of a Tesla, a smooth ride, and excellent displays, the 2018 Chevy Bolt EV suffers only from some economy-car materials inside. The thin front seats are a distinctive feature of the Bolt EV, but they're also polarizing. While our testers all found them comfortable, larger adults may find them too narrow and too thinly padded. That thinness gives an extra inch of legroom for rear-seat riders, GM says, but a handful of shoppers have dubbed the seats sufficiently uncomfortable that they eliminate the Bolt from consideration. This is one where you need to drive the car for yourself, preferably for 30 minutes or more, to see how you fit into the seats and how they last once you settle in. 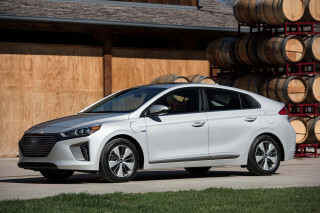 Overall, we found both the front and the rear seats comfortable, with a pleasant upright seating position that's far more elevated than in the lower, sleeker Chevy Volt plug-in hybrid. The Bolt EV's flat floor, with battery underneath, and slim console and dash make the front footwells especially wide. While the "five-passenger" description is probably pushing it, we found four adults can sit comfortably, and likely wouldn't hate long road trips in the car. Behind the steering wheel, drivers will see a fully digital 8.0-inch instrument cluster, along with a 10.2-inch touchscreen display centered in the dash above the console. Thin fonts on a bright white background make the user-configurable displays seem more like a mobile website for swiping than any kind of old-school automotive instruments. As for hauling cargo, goods, and "stuff," the Bolt EV's deep cargo bay features a two-level floor. At its highest level, it aligns with the folded rear seat back, giving a hidden compartment underneath. Alternatively, owners who slide out the false floor—it cleverly tilts into a slot just behind the rear seat back—will gain several extra inches of height for taller items. The 2018 Chevy Bolt EV gets high marks from the IIHS, though the NHTSA hasn't rated it; a few electronic safety features we'd have expected are missing. Only one of the two ratings bodies that tests car safety has weighed in on the 2018 Chevrolet Bolt EV, so we don't have full information on its crash safety. The NHTSA has no ratings for the Bolt EV, but the IIHS gives the electric car its top rating of "Good" in every category, including the tough small-overlap frontal crash test. The institute also rates its headlights as "Poor," though that's a judgment shared with dozens of other new cars, so the Bolt EV is hardly unique there. The IIHS also awards the Bolt EV a Top Safety Pick rating, though it doesn't get the coveted "+" added to the end of that title, which would indicate the latest electronic active-safety systems and good headlights. That's one area where the Bolt EV falls down against competitors of similar size or price, if not necessarily comparable battery-electric cars. An optional $495 Driver Confidence II package adds forward-collision warnings with automatic emergency braking, lane-departure warning with active lane control, and automatic high beams. But a number of other advanced features—adaptive cruise control and high-speed emergency braking among them—are not available at any price, which seems unusual for a car that can easily cross a sticker price of $40,000. Other safety notes: the Bolt EV has an optional video rearview mirror, which displays a wider panorama in the inside rearview mirror than the customary view out the rear window. It takes some getting used to, and isn't as useful for judging exactly how close a car behind is following, but it certainly solves the problem of increasingly obstructed rearward vision. The Bolt's rearview camera, meanwhile, is extra-sharp and far crisper and better in its resolution than those fitted as standard to many cars in its class. The 2018 Chevy Bolt EV offers fast-charging as an option, but has a few features unusual in its class, including the digital rear-view mirror. Just two changes distinguish this year's model from last year's Bolt EV: Chevy has replaced last year's manually controlled heated steering wheel with one that automatically switches on when the car determines its need, based on ambient cabin temperature and other factors. Also, a map pocket on the back of the front passenger seat has been eliminated from the intermediate 2LT trim level. That's it. Standard equipment on every Bolt EV includes LED daytime running lights and high-intensity discharge headlights, automatic climate control, a rearview camera, the useful regen-on-demand paddle behind the steering wheel, a 60/40 folding rear seat back, a pair of USB ports, a 10.2-inch touchscreen display in the center of the dashboard, and a digital driver-information center measuring 8.0 inches between the instruments. The Bolt EV in its base LT version, starting at $37,500 including delivery, comes with painted 17-inch aluminum alloy wheels and a manually adjustable front seat—and a choice of three options. A safety package dubbed Driver Confidence I includes blind-spot monitors, lane-change alert, rear cross-traffic alert, and rear parking assist. A pricier Driver Confidence II package adds active lane control and low-speed automatic emergency braking. Finally, a comfort and convenience package adds a heated leather-wrapped steering wheel, heated front seats, and an auto-dimming rear-view mirror. The higher-level trim, the Bolt EV Premier, adds more than $4,000 to the price. It bundles in the LT's two option packages as standard equipment, plus leather upholstery, heated rear seats, a clever and useful false cargo floor to hide a compartment under the load bay, and light piping in the interior. Finally, the Premier trim includes "ultra-bright" machined 17-inch aluminum wheels, roof rails, turn signals in the door mirrors, and surround-view in the center dash display. The top-level Premier trim has its own pair of options. The Driver Confidence II package adds forward-collision warnings with automatic emergency braking, automatic high beams, and lane-departure warning with active lane control. Finally, an infotainment package bundles a premium audio system, two more USB ports for the rear seats, and wireless device charging in the console. No navigation system is offered, but Android Auto and Apple CarPlay are standard, which let the driver use a smartphone to provide directions that play through the Bolt's central display and its audio system. By far the most important option for the Bolt EV—one every buyer should specify regardless of trim level—is the $750 DC fast-charging port, using the Combined Charging System (CCS) protocol adopted by all German companies and all U.S. makers except Tesla. This is a must-have to make the Bolt EV practical for longer road trips, and it will likely also ease charging for buyers who live in apartments. 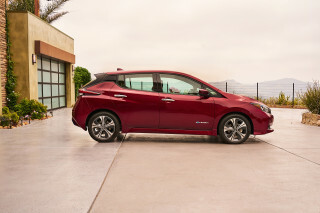 The lack of fast-charging capability is likely to be reflected in the car's sale price when used. The 2018 Chevy Bolt EV is all-electric, with no tailpipe emissions at all, and it's energy-efficient to boot. The 2018 Chevrolet Bolt EV is GM's first high-volume battery-electric car, selling at close to 3,000 units a month. No gasoline engine is available; the only way to use it is to plug into an outlet to recharge its onboard battery pack. That means it has no tailpipe, and hence no emissions. As numerous studies have shown, electric cars have far lower wells-to-wheels emissions of carbon dioxide, a climate-change gas, than the average new car sold in the U.S. today even if they're charged on the dirtiest, most coal-intensive grids in the U.S. If they're charged on cleaner grids, like those in California and parts of the Northeast, they emit so little that a gasoline car would have to be rated at 80 to 110 mpg to equal them—and that's pretty much impossible. While GM says the optional DC fast-charging connector will provide "90 miles in 30 minutes," today's CCS charging stations are rated at a maximum output of 50 kilowatts. GM executives say the company has no plans to fund the installation of fast-charging infrastructure across the country—a contrast not only to Tesla, with its nationwide network of Supercharger sites, but also to BMW, Nissan, and Volkswagen, all of which have various plans to expand fast charging for their U.S. customers. Looking for a different year of the Chevrolet Bolt EV?